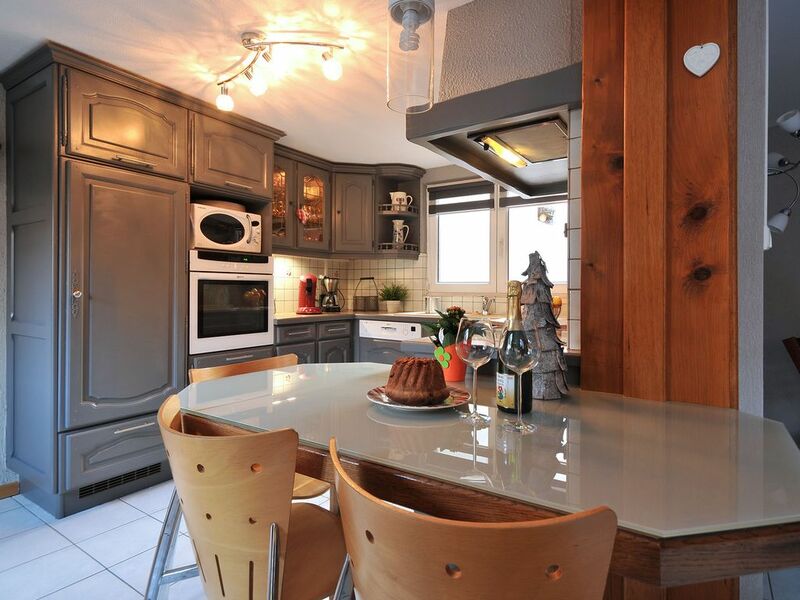 Cottage Edelweiss of 110m2 with terrace, in the heart of Eguisheim ... Quiet! Our cottage "Edelweiss" classified 4 stars is located on the first floor of a half-timbered house, it welcomes you throughout the year, with a capacity of 2 to 6 people. With an area of ​​110m2, spacious and very well located in the historic heart of the small town of Eguisheim (1800 inhabitants). Eguisheim "elected the favorite village of the French" is 5 km by car from Colmar. Three bedrooms (2 beds 160 / 200cm and 2 beds 90 / 200cm), a large dressing room that will contain your personal belongings, a functional bathroom with bath and shower, a separate toilet, a kitchen open onto a beautiful living room with a large corner sofa and a private terrace of 80m2 for outdoor dining, not overlooked. We provide free high chair, changing mat, bath and cot on request. Free toys for children, table football, ping-pong and punching bag. The color palette is warm and soothing. Non smoking apartment. A warm welcome is reserved for you. Private garage attached to the house that can accommodate your car and your bikes. Bakery, butcher, caterer, grocery-tobacco-press and many restaurants close to our rental. Eguisheim elected the favorite village of the French in 2013. - National Grand Prix since 1989 and Gold Medal at the European Floral Agreement in 2006). Sixteen cours colongères, fountains, the parish church houses a polychrome wood sculpture called 'Virgin Opening'. This work of the 13th and 14th centuries is the only example of this type in Alsace. The lower castle of Eguisheim, in the Place Saint-Léon, is backed by an octagonal enclosure characteristic of the 13th century, made of stones with bosses. Thick by more than 2 meters in places, this wall was surrounded by water ditches, drained in 1835. The castle is accessible only as part of the guided tours offered by the tourist office. bathroom equipped with 2 sinks, bath and shower. It is functional, clean and pleasant. Towels available for your comfort. Owners Tania and Yannick (the 'little boss'!) are very friendly even leading us in our car through the very busy and narrow streets on his MTB. The apartment had more than everything required for our family of four. The garage was very useful for storing the car and, most importantly, my bike. Eguisheim and the surrounding vineyards are very pretty with lots of other old villages to explore around the area if you feel the need to wander. There are plenty of restaurants (even for our fussy children) in the town and lots of shops to keep supplied with essentials. Colmar is only 20 minutes away if you need bigger shops. The weekend we arrived was the wine festival so late nights and music were obligatory. It was an excellent way to sample all the local wines though. During the rest of the week it was much quieter and we also enjoyed cycling through the small lanes amongst the vineyards. All in all, a great place to stay. Our family of 5 spent 6 nights at this modern and clean rental in the lovely town of Eguisheim this past May. We wanted to stay in a “small and quaint” village while exploring the Alsace region so we chose Eguisheim as the home base because it was less “touristy” than some of the other popular villages. The 3-bedroom rental unit is located on the 2nd floor (or European 1st floor) of a charming old house that is only steps away from the main square. Although there’s a private attached garage, it is difficult to access it if you have a large vehicle because the street leading to the garage is very narrow. We ended up parking our van in the spacious visitor parking lot at the town entrance, a mere 5 minute walk from the apartment. Parking there is free from 7 pm – 9 am and only 3 Euros for the entire day at other times. The apartment itself is well-furnished and equipped with modern conveniences for an enjoyable stay. The only downside is it only has 1 bath/shower room and 1 toilet which required some coordination for our family of 5 to get ready each morning. In spite of that minor inconvenience, we thoroughly enjoyed our stay at Tania’s apartment and would not hesitate to recommend it. Tania, thank you for sharing your lovely apartment and beautiful town with us. We hope to return in a near future. We had a lovely holiday in this very spacious warm well equipped, extremely comfortable apartment.The immediate area having a Christmas market added to the lovely atmosphere of Equisheim. We hope to return! Over the years, we've rented about 10 different vacation properties in various parts of France. This apartment was certainly the most spacious, well-equipped, and attractive of them all. Even though it's in an old building in the center of town, it has been renovated to a very high standard, including double sinks in the bathroom. It's sparkling clean. The master bedroom is quite spacious, with a queen-size bed and an oversized closet. The very large terrace is a real plus for relaxing, taking meals, etc. The kitchen is stocked with large quantities of dishes and silverware. And a garage right on the property is another huge benefit. Even though the apartment is on the main street of town -- with all town shops, restaurants, and services just seconds or minutes away -- the master bedroom and the terrace are both oriented to the back, so they are quiet at all times. Note that this is not someone's home when it is not being rented, so you need to bring (or buy, at a hypermarché very close to town) any disposable kitchen supplies, foodstuffs, condiments, etc., you might want during your stay. The lovely proprietors, Tania and Yannick, run a gift shop in town, so they are always accessible if you need them. Our highest recommendation! Wir haben eine Woche mit zwei Kindern hier verbracht. Die Terrasse ist gut geeignet um zu entspannen. Es wäre schön wenn es mehr Möglichkeiten gäbe um die Duschtücher aufzuhängen und diese jeweils eine andere Farbe hätten. Das ist das einzige, sonst hat es wirklich alles in der Wohnung, was man braucht. Small towns to visit: Kaysersberg 11km, 13km Munster, Riquewihr at 14km, 17km Ribeauvillé. The Ecomuseum Ungersheim 18km, the castle of Haut-Koenigsbourg 23km. Zoo of Mulhouse at 34 km and the car museum and the railway. Sites of great natural beauty: Hohneck 22 km, the fire field 39 km and the balloon of Alsace 43 km. The Vauban fortifications of the town of Neuf-Brisach. Nous louons notre gite à partir de 6 nuits ( sauf en juillet, aout et decembre ou nous louons uniquement à la semaine). Nous vous accueillons avec un grand plaisir tout au long de l'année. Notre appartement est idéalement situé au coeur du centre historique d'Eguisheim, au calme... Chien de petite taille admis mais interdit de canapé et de lit. Merci. N'hésiter pas à nous contacter pour plus d'information!